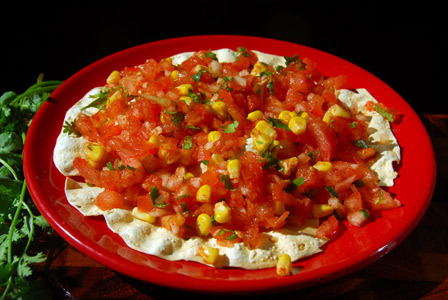 Tomato and onion are finely chopped and mixed with sweet corn and spice powders. The mixture is then layered on to freshly roasted papad and papad tomato chaat is served immediately. Makes: One Serving of Papad Tomato Chaat. Wash and finely chop the tomato discarding the seeds. Microwave papad for around 25 seconds and remove onto a plate. Alternatively, heat the papad on direct flame until crisp. In a mixing bowl, mix together tomato, onion, sweet corn, red chili powder, salt, sesame oil, lemon juice and cilantro. Notes: Make sure to remove the seeds inside the tomato. Suggestions: Adjust any seasoning if necessary. Variations: You can also layer few pinches of chaat masala onto the papad. Check other recipes with papad here. Other Names: Papad Tomato Chaat. Potatoes are boiled, peeled and mashed with spices. Chopped onion, potato mixture and herbs are layered on roasted papad along with chaat masala powder. Serve papad potato chaat immediately. 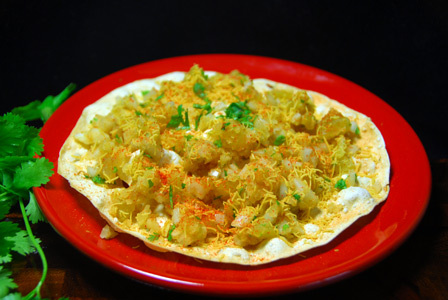 Makes: 2 Servings of Papad Potato Chaat. Wash and halve the potatoes. Boil the potatoes in water for around 15 minutes or until it is cooked. Peel and mash the potato and keep aside. Clean and finely chop cilantro. In a mixing bowl, mix together mashed potato, half of chaat masala, cumin powder, onion, roasted peanuts, cilantro, lemon juice and salt. Place the papad in microwave for half a minute. In a serving plate, place the roasted papad. Layer the roasted papad with potato mixture and few tablespoons of sev. Sprinkle chaat masala and red chile powder. Garnish with cilantro and serve papad potato chaat immediately. Notes: Make sure to roast the papad just before serving. Suggestions: Make sure to adjust red chili powder and lemon juice according to your preference. Variations: Check other papad recipes here. Other Names: Papad Potato Chaat. Dry peas are first soaked overnight and cooked till soft using a pressure cooker. The cooked dry green peas are then briefly fried to remove any excess moisture. The peas are then mixed with chaat masala and lemon juice. Serve dry peas chaat garnished with cilantro and a pinch of chaat masala. Makes: around 4 Servings of Dry Peas Chaat. Soak dry green peas in water overnight and pressure cook in 2 cups of water for 2 whistles. Mix together chaat masala, red chile powder and salt. Heat oil in a pan on medium flame, add cumin seeds and curry leaves. When cumin seeds change color, add cooked green peas and turmeric powder. Fry fry for a minute or two, season with salt and remove from heat. In a mixing bowl, mix together cooked peas, chaat masala mixture, lemon juice, onion and cilantro. 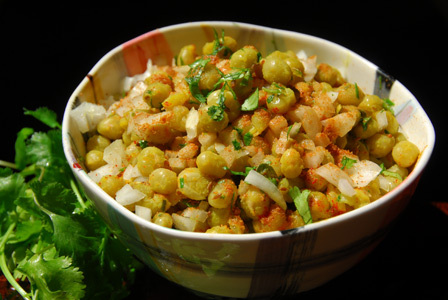 Serve dry peas chaat garnished with cilantro and a pinch of chaat masala. 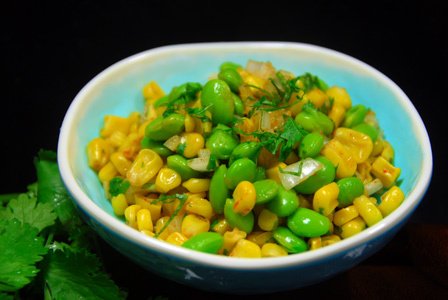 Notes: Make sure dry green peas are cooked well or cook it in the pan till soft. . Suggestions: Make sure to adjust red chile powder and chaat masala to taste. Variations: You can also add finely chopped tomato to the dry peas chaat. Other Names: Dry Peas Chaat, Pacchi Batani Chaat. 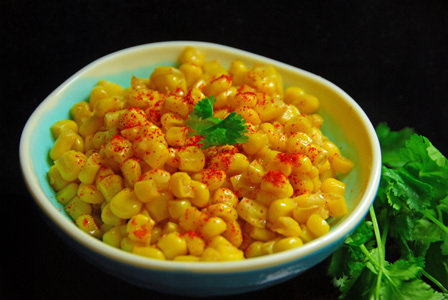 Sprinkle red chile powder and garnish the corn chaat with cilantro. Notes: Make sure corn is cooked well before adding the spice powders. Suggestions: Make sure to use minimum oil and make sure not to burn any of the spices. Variations: You can also add mustard seeds or cumin seeds to the oil before adding corn. Other Names: Quick Corn Chaat.